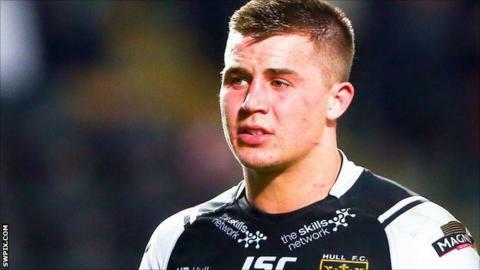 Hull FC scored seven tries to one to leave strugglers London Broncos still awaiting their first Super League win of the season. Full-back Jamie Shaul and half-back Jordan Rankin both scored two tries apiece, while Ben Crooks, Jordan Thompson and Jacob Miller also crossed. Crooks also successfully converted six of seven tries for the Airlie Birds. London's sole reply came midway through the second-half through centre Mason Caton-Brown. While London were unable to build on their spirited defeat by Catalans last Thursday, Hull bounced back from derby defeat at city rivals Kingston Rovers with a solid display. Shaul was put away for the opening try after a flowing move inspired by Miller, and fellow academy product Crooks followed soon after when he skipped through from 20 metres. Denny Solomona wasted an easy score for London when he spilled the ball close in, and Hull made them pay when Thompson hit a fine line from Joe Westerman's pass to cross, and Rankin collected Gareth Ellis' offload to streak clear from 40 metres. Half-back Miller slipped in for a score of his own after the half-time break, and Shaul collected his own dink over the top to ground the ball as Lee Radford's side exerted control. The visitors eventually found a glimmer of joy when Caton-Brown wriggled into avoid an embarassing nilling, but it was little consolation as Rankin got a second to finish off the scoring with 10 to play. "I thought it was a professional performance as it's been hard to get back up from the canvas from Thursday [defeat by Hull KR]. "It was a professional performance as the tempo was right and I thought we dictated the play well. We said before the game the first error we made would be heckled, if we missed out first kick the crowd would have been on our back because of Thursday, so we had to try and create our own atmosphere. "You could hear a pin drop at times, so we had to create an atmosphere with our performance. We are stinging from Thursday so we wanted to respond with a performance." "We did some decent things and we are courageous. I think we're fine and I think we're closer than we were on Thursday. "We probably didn't play the conditions and the wetness the way they did, but fair play to Hull for handling it better than us. "But we're okay, we're fine. We've had an error-riddled Easter, but we're fine and confidence isn't an issue." Hull FC: Shaul, Colbon, Crooks, Whiting, Talanoa, Rankin, Miller, Paea, Heremaia, Carvell, Ellis, Pitts, Westerman. Replacements: Houghton, Thompson, Paleaaesina, Horne. London Broncos: Mataitonga, Macani, Minns, Caton-Brown, Solomona, Farrar, Drinkwater, Greenwood, Moore, Krasniqi, Vea, McMeeken, Cook. Replacements: Slyney, Wallace, Bishay, Woodburn-Hall.